It’s pancake day! AKA another annual tradition brutally shorn of its spiritual associations in order to encourage mass consumption. Not that we’re particularly bothered when we’re shovelling that glorious sticky mess into our gobs to be honest. Who needs God when you’ve got eggs, flour, bananas and Nutella? In Christian countries the reason Shrove Tuesday became Pancake Day was because it was the last day before the fasting period, so a good opportunity to use up any ingredients that would spoil over the next forty days. While these days that would probably mean we’d be eating some gross combination of mustard, humous, Fruit Corners and Pilgrim’s Choice, luckily back then they only tended to have milk, eggs and flour knocking about. Pancake Day was born. In the Slavic pagan tradition pancakes apparently symbolised the warmth and light of the sun, whose arrival was obvious cause for celebration. Metz don’t quite go as far as eating a gigantic, flaming celestial body in the video (or ‘not the video’ apparently, but whatever) for new track ‘Acetate’, but it still contains some impressive feats. Plus, of course, some of the abrasive distortion and rabid roaring that their fans have come to know and love. 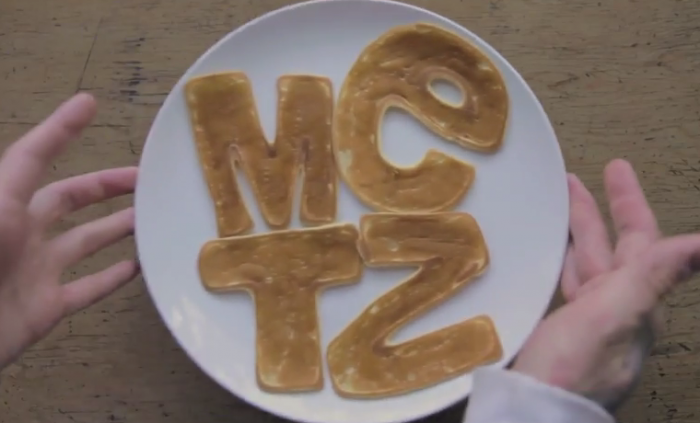 Directed by artist and pancake enthusiast Travis Millard, it sees a chef in a Metz t-shirt adding a few unexpected ingredients (snails, elastic bands, twelve-sided dice) to his batter mix, watched on by his slightly perplexed dog. The rock and roll results are a sight to behold – if you can make anything nearly as impressive as the pentagram pancake then you’re doing Pancake Day properly. If blasphemously.